As we head towards COP21 in Paris at the end of 2015, various initiatives are coming to fore to support the process. So far these are non-governmental in nature, for example the “We Mean Business” initiative backed by organisations such as WBCSD, CLG and The Climate Group. In my last post I also made mention of the World Bank statement on Carbon Pricing. These make a lot of sense and much has been written about them in other publications, except perhaps the second last one. Some time back I made the point that the solar PV enthusiasts tend to forget about the industrial heartland; that big, somewhat ugly part of the landscape that makes the base products that go into everything we use. Processes such as sulphuric acid, chlorine, caustic soda and ammonia manufacture, let alone ferrous and non-ferrous metal processes often require vast inputs of heat, typically with very large CO2 emissions. In principle, many of these heat processes could be electrified, or the heat could be produced with hydrogen. Electrical energy can, in theory, provide this through the appropriate use of directed-heating technologies (e.g. electric arc, magnetic induction, microwave, ultraviolet, radio frequency). But given the diversity of these processes and the varying contexts in which they are used (scale and organization of the industrial processes), it is highly uncertain whether industrial processes can be decarbonized using available technologies. As such, the report recommends much greater efforts of RD&D in this area to ensure a viable deep emission reduction pathway. Two key elements of the report have also been adopted by the USA and China under their U.S.-China Strategic and Economic Dialogue. 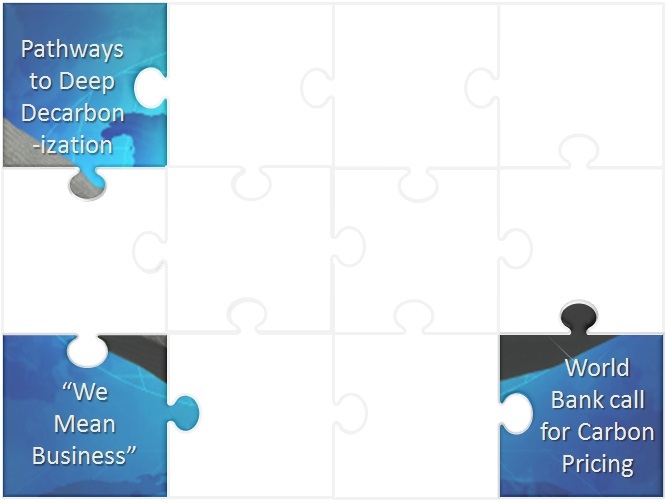 In an announcement on July 9th, they noted the progress made through the U.S.-China Climate Change Working Group, in particular the launching of eight demonstration projects – four on carbon capture, utilization, and storage, and four on smart grids. Reading through the full Pathways report I was a bit disappointed that a leading economist should return to the Kaya Identity as a means to describe the driver of CO2 emissions (Section 3.1 of the full report). As I noted in a recent post it certainly describes the way in which our economy emits CO2 on an annualised basis, but it doesn’t given much insight to the underlying reality of cumulative CO2 emissions, which is linked directly to the value we obtain from fossil fuels and the size of the resource bases that exist. The truth is that governments have not yet tried hard enough—or, to be frank, simply tried in an organized and thoughtful way—to understand and do what is necessary to keep global warming below the 2°C limit. I think he’s right. There is still a long way to go until COP21 in Paris and even further afterwards to actually see a real reduction in emissions, rather than reduction by smoke and mirrors which is arguably where the world is today (CO2 per GDP, reductions against non-existent baselines, efficiency improvements, renewable energy goals and the like). These may all help governments get the discussion going at a national or regional, which is good, but then there needs to be a rapid transition to absolute CO2 numbers and away from various other metrics. David﻿, for you and your employer — and the entire industry — the bottom line in achieving what you calls for is: Start retiring the refineries quickly and replace the refineries with renewables … by all means necessary. Let the resulting demand-supply gap create the ‘de facto’ carbon fee that just about everybody now is calling for, and let the R&D and replacement begin at a feverish pace. I am convinced that we will all pay the piper, and there will be no “dividend” so let’s no procrastinate.